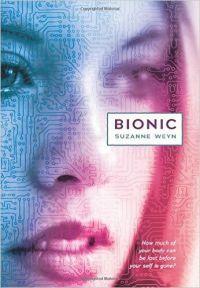 Bionic is a fun book appropriate for teens about a young girl that gets into a horrific car accident. She tries to adjust to her new life which involves getting several cutting edge robotic parts. Not only does she get a new arm and leg but also several science fiction-like modifications that allow her to gain muscle mass very quickly and learn extremely fast. The main character, Mira, was written well as she had real life concerns and interests. Before the accident she played lacrosse and was hoping for a college scholarship. Now she is just trying to adjust to all the changes and it isn't easy. I liked this audio book and found it a fun, quick story. Mira was a real person and I enjoyed listening to her reactions to learning new amazing skills such as playing guitar much better after her latest chip implant into her brain. We are quickly getting to a reality where technology is advancing to a point that people with disabilities can really improve their quality of life and it was nice to see Mira both thrive and struggle with adjusting to her changes. The story also mentioned how other may want the technological enhancements for purely cosmetic reasons which makes you think. I think those that like teen-level stories or light science fiction will enjoy this book and I give it four out of five stars.